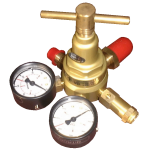 An essential piece of equipment to pressurise stored pressure fire extinguishers. Top quality solid brass assembly. Outlet up to 28 bar. You will also need a charging hose and you may need a set of extinguisher filling adaptors.